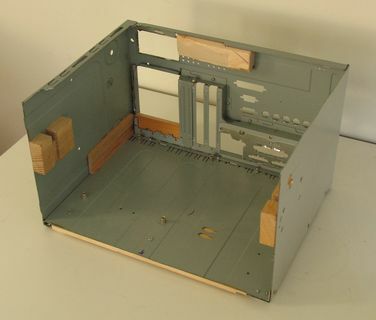 When I finally got my hands on a decent scrounged Pentium 4 class motherboard for my original wooden computer case, I found that this motherboard was 1 cm too deep to fit in the case. This was a bit of a setback, but I didn't want to settle for one of those gigantic regular ATX cases. 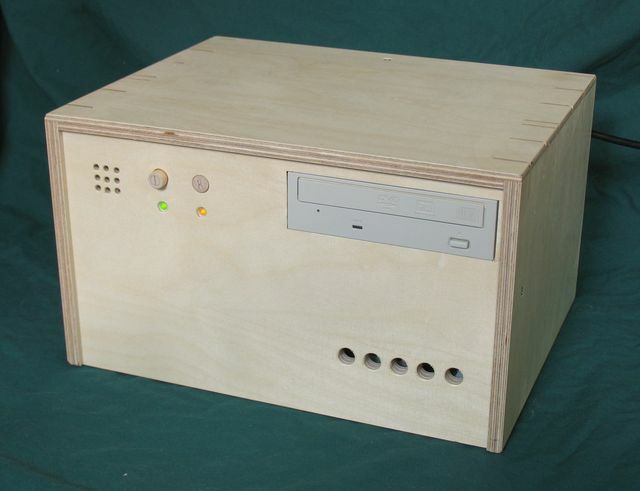 So I set out to build another small wooden computer case, this time going about it a bit more systematically. As with the previous case, I started by cutting up an existing ATX computer case with an angle grinder. The layout of the components for this one was going to be slightly different though. I decided not to mount the power supply over the CPU as I had done last time. With the extra height of the P4 heat sink and fan, I figured I'd want to leave a bit of extra space above it. In the mean time, this more modern motherboard had network and sound already on the board. I also wasn't contemplating using this machine in a dial-up environment, so that meant I didn't need to have slots available for network, sound and modem cards. All that I really neede was space for the video card. So I figured it would be ok to mount the power supply in the space above the last four PCI slots, still leaving the AGP slot and two PCI slots available for whatever unanticipated needs might arise. 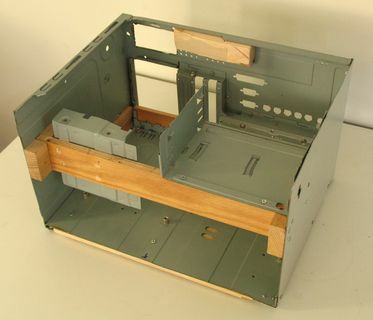 For the most part, I was able to build a smaller, but ugly metal PC case out of the cut up parts of the larger ATX casee, although without a top and front. I used #4 countersink screws to attach the various bits of metal together. Really quite amazing how well that works, and how little metal working was required. Other than the angle grinder, the only tools I needed were tin snips, a vise, a cold chisel, and various drills. I did have to add a few extra pieces of wood on the inside. Some to help hold the power supply, so that even if unscrewed, it would never crash onto the motherboard. 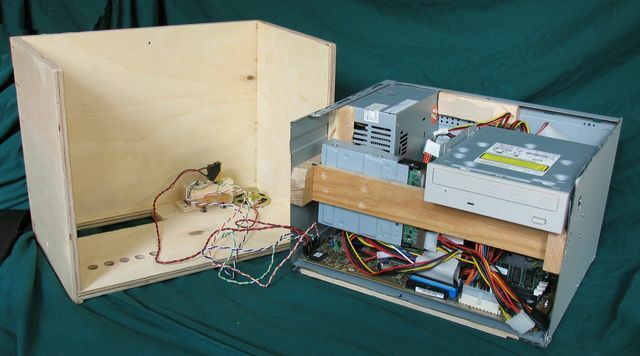 The other part was a beam to hold the CD-rom drive, and the hard drive. This beam slides into slots on either side of the modified metal chassis. Its meant to be removed when servicing the case. 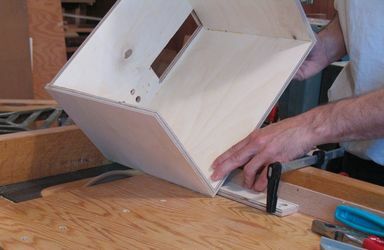 The wooden case itself consists of the top, front, and sides, glued together. I made it out of 11 mm thick "russian birch" plywood. 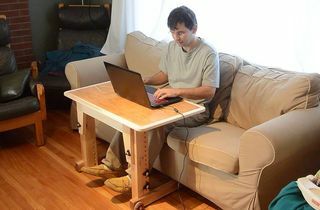 It's a very high quality, although a bit expensive plywood made of birch. Fortunately, I didn't need much of it. With the CD-rom slot near the one side, I was able to just cut that slot out from the side with a table saw. I get much nicer cuts that way, which is important, because the edge cuts of the cd-rom slot are visible right at the front. 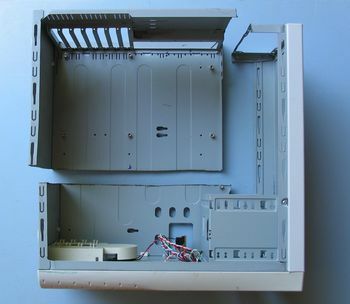 The front panel is recessed a little, and dadoed into the top and sides of the case by 4 milimeters. I used a rabbet joint to join the top and sides. 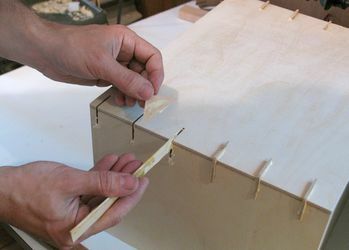 The rabbet joint itself is not overly strong though, so I reinforced the corners by gluing little triangles into them. 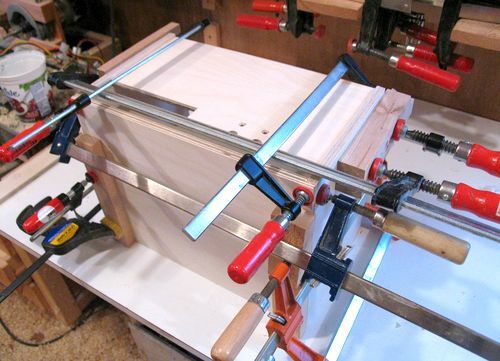 Note that on the photo above left, the case is actually sitting on my table saw sled, which I slide with the case. So even though it looks like a freehand cut, it isn't. 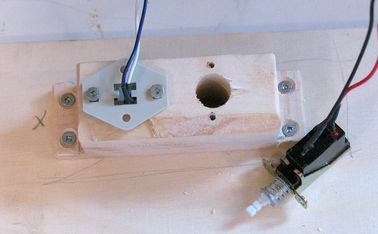 For the switches, I attached a block of wood to the back of the front panel, and just drilled 1/2" holes from the front case and through the block, thus ensuring the holes would be properly alinged. With the block of wood behind the front panel, I had plenty of depth for pieces of dowel to act as wooden buttons to slide back and forth without jamming. 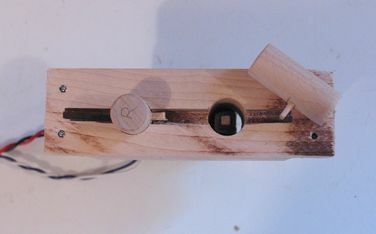 I stuck a pin in the side of each dowel, and cut a slot in the block for the pin to slide in. this pin is to make sure the button stays oriented the same way, and doesn't fall out the front of the case. 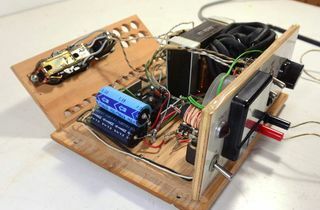 The actual electrical power and reset switches were simply attached to the back of the block, so that pushing the wooden button on the front would push the actual button on the back. And finally, a picture of the computer case with all the components mounted inside. 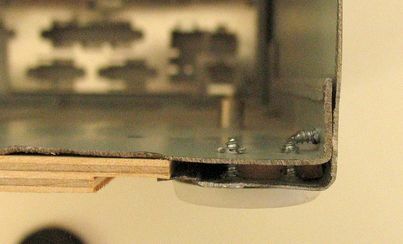 The top cover is attached to the main chassis with just three screws - one on each side near the front, one from the top at the back. I would perhaps have used more, but as it was, these were the only points I could screw in from while maintaining symetry and not risk puncturing some part of the computer. And a view from the back. 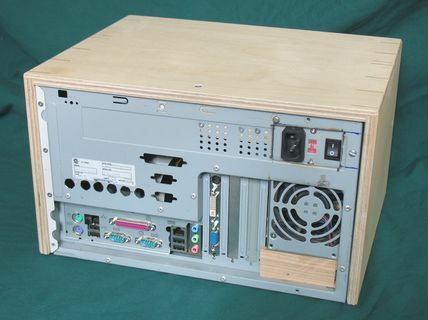 Note that the space around the power supply is blocked off, and all the knockouts on the CPU side of the back panel are punched out, plus a row of extra holes. 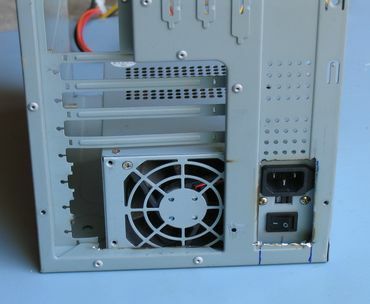 This to ensure the air comes in on the power supply, and flows past the CPU headsink and through the case, rather than just getting sucked in right next to the power supply.